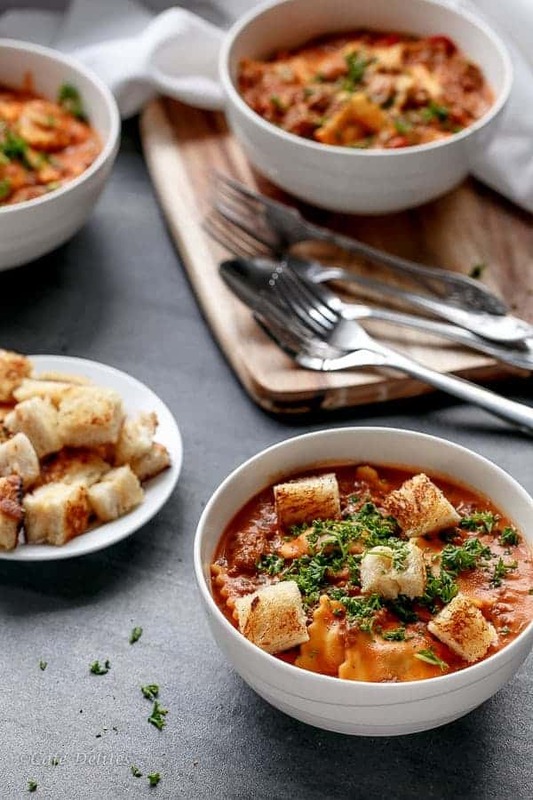 A one-pot, rich tomato based cream sauce simmered to creamy perfection, cooked with ravioli inside the sauce for extra richness and flavour. Topped with crunchy grilled cheese croutons, there were no complaints happening around the dinner table over here. Less pans means less washing up and more time to enjoy the best part – eating! Oh, hi again my pasta loving friends. It’s juts me over here on carb-coma-cloud-9, waving my flag proudly sitting on this planet of tomato sunshine and pasta love with crunchy croutons flying around the place. How you been? Well, lemme’tellya, I been great. School holidays means more time with my babies, and dragging them into the kitchen, kicking and screaming with me, to cook up crazy dishes. Just kidding. Or….am Iyyyyyy??? (In my best Sienfeld voice). 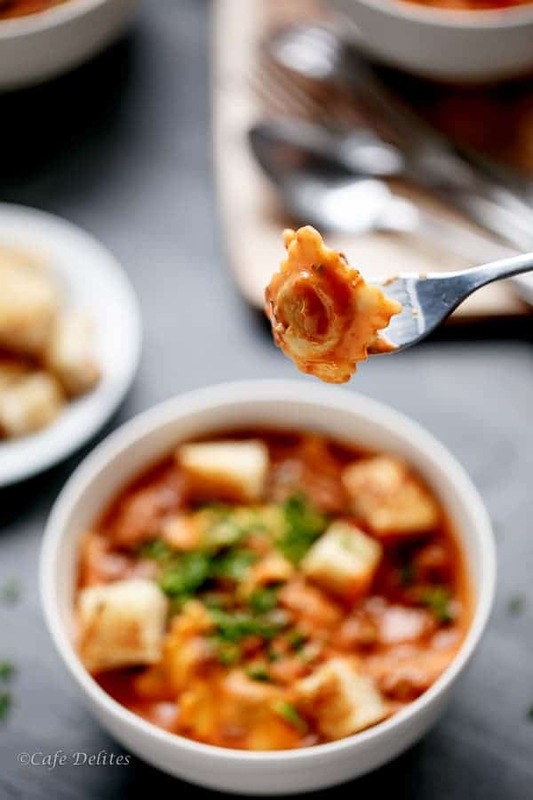 Can I just say….grilled cheese on it’s own completes me….and pasta (especially ravioli) completes me….but mix them together and dunk grilled cheese into a bowl of ravioli drenched in creamy tomato sauce? Well, my soul is now complete. Because, as you’re stirring the ravioli through the sauce, in awe of the amount of richness going on (with half the fat of normal creamy sauces — may I add), the croutons begin to absorb the rich tomato flavours, and biting into the crispy fried croutons only to meet the melted cheese just sitting and oozing in the middle is a cheese lovers paradise. 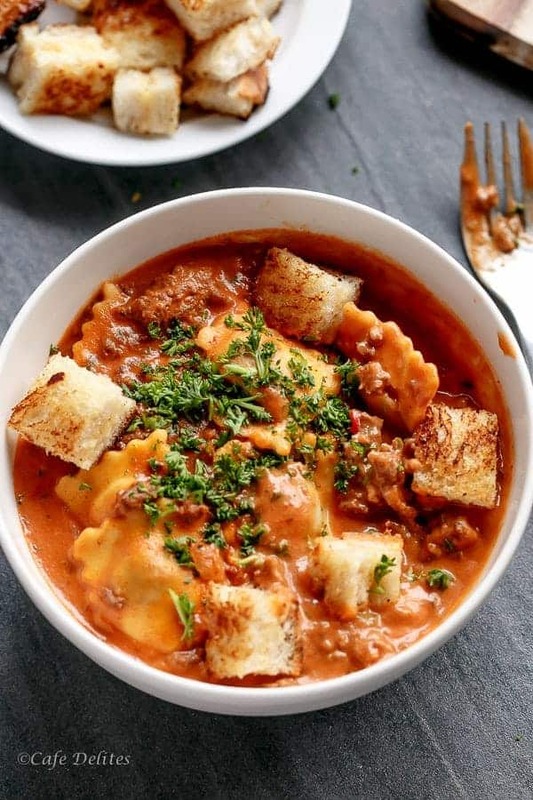 Melted cheese, rich tomato sauce and ravioli, all-in-one. Need I say more? I’m not gonna lie here. Fuzzy slippers, nightgowns and piping hot bowls in front of the t.v. And all made with simple ingredients you most probably definitely I’m sure of it have sitting on your cupboard shelves waiting to made into something so spectacular….like this. Wow ’em on the weekend. They won’t know what hit them. Believe it or not, one bowl-full later and you don’t want anything else. No dessert? Nope. No ice cream? Nope. Just this satisfying bowl is enough. And I have another confession to go with the 20 million ones already posted on here. I ate while I shot. Kinda went like this: one crouton for the bowl….two croutons for me. On repeat. Blogger problems 101. But in short? Make.this. 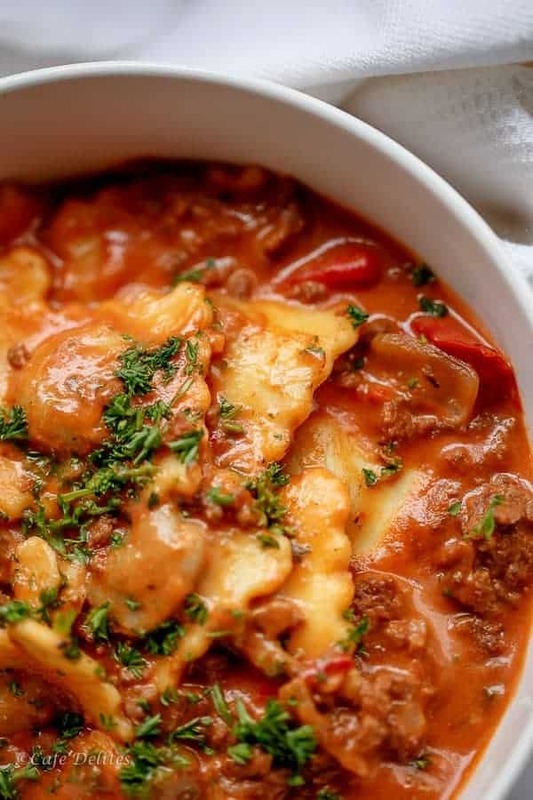 The most comforting food on this planet….pasta. May have served that Nutella Stuffed Skillet Cookie for dessert. A one-pot, rich. tomato based cream sauce simmered to creamy perfection, cooked with ravioli inside the sauce for extra richness and flavour. Topped with crunchy grilled cheese croutons, there were no complaints happening around the dinner table over here. Heat a large saucepan over medium heat with a little cooking oil spray. 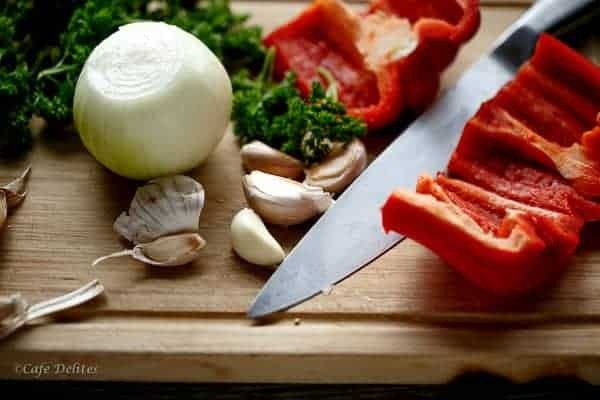 Add the onion and garlic, and cook until onion has softened and garlic is fragrant. Add the ground beef and cook until browned, while breaking up any large pieces with the tip of your wooden spoon. 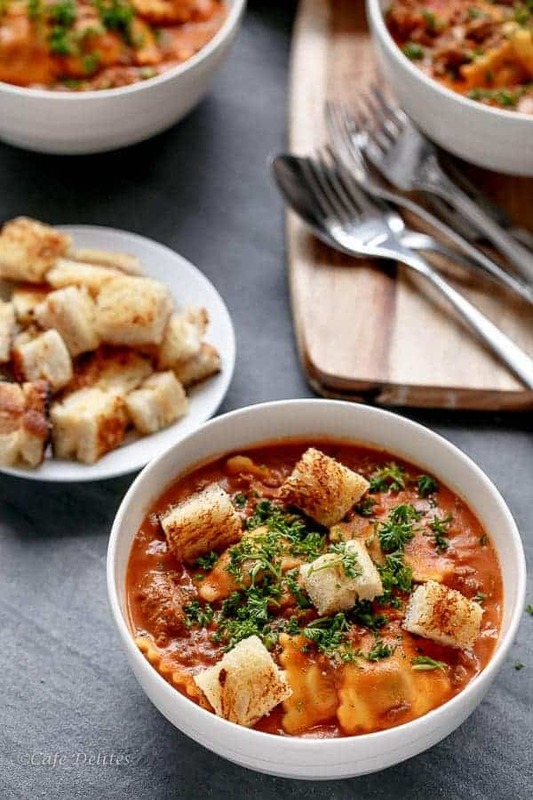 Pour in the tomato soup (or crushed tomatoes), water, stock powder (or stock), sugar, parsley, red chilli/pepper flakes and tomato paste; season with salt and pepper, to taste. Bring to a boil and stir in ravioli. 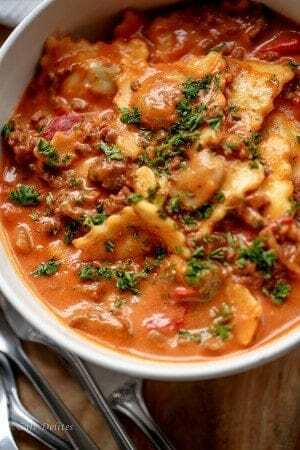 Reduce heat and simmer until ravioli is soft and cooked through. While ravioli is simmering, prepare grilled cheese sandwiches; fry them in a nonstick pan until browned on both sides and cheese has melted. 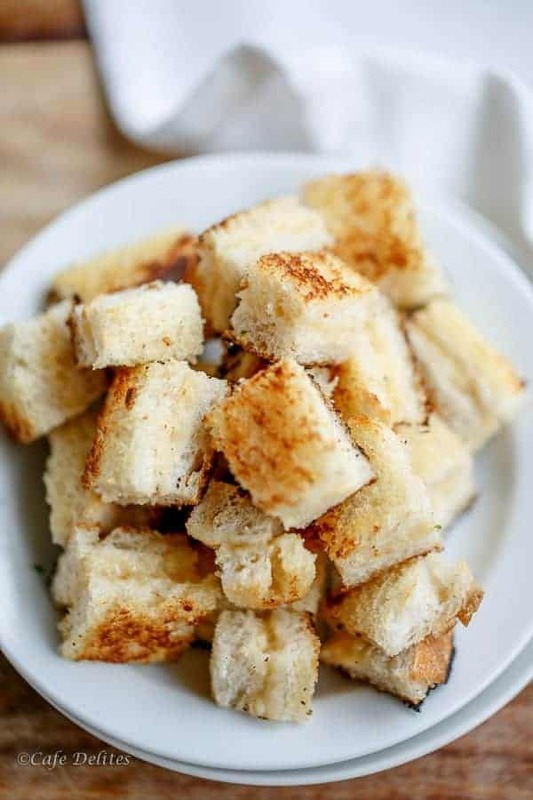 Remove from heat; allow to cool slightly; cut off crusts; and cut into bite sized cube/crouton pieces. Return to the ravioli; stir in cream and mozzarella cheese until well combined, cheese has melted and heated through the sauce. Serve immediately, garnished with the grilled cheese croutons and (extra) fresh parsley. I just made this for dinner for me and my boyfriend and it is so good! my first time making ravioli. I used a couple tbsp of light cream cheese cause i couldn’t find the ‘extra light’ and i didn’t wanna make it too heavy, skipped the grilled cheese croutons altogether and used ginger-garlic paste instead of cloves, but I do that for any recipe that calls for garlic anyway hehe. Also used a 5 cheese ravioli instead of beef, since the sauce had plenty beef already. Hi, I can’t seem to find the Philly cream. Is there something else I can substitute it with? 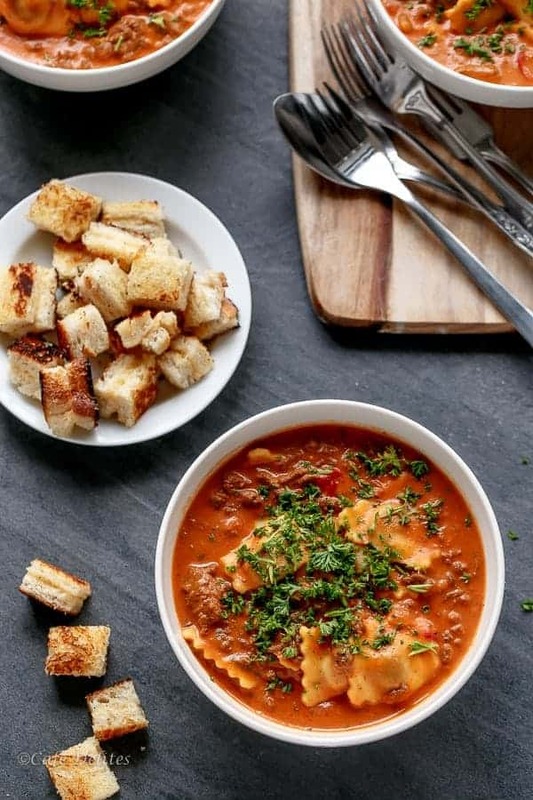 That’s the kind of dish we need to warm us up on these cold winter days! Oh I agree! Warms up every body part. Thank you for coming by!